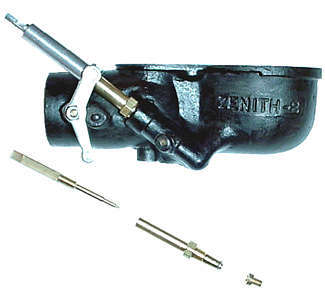 The Gas Adjusting Valve provides a manual adjustment for additional gasoline to the Cap Jet, bypassing the metering effect of the Compensator Jet. The carburetor was designed slightly lean to allow for high altitude driving and, with the GAV, is able to provide additional fuel as needed. This extra fuel is normally needed when the vehicle is cold and at low engine speeds. The threads on the needle and inside the housing are 1/4-24. Use 1/4-24 tap and die to clean up imperfect GAV housings and needles. Smooth running needles make for easier adjustments on the dash. A replaceable Brass Seat was used through 1929. An integral Seat, machined in the Lower Casting, was used after that. The Seat opening is honed to match the shape of the GAV Needle. Notice that the Brass GAV Seat looks much like the Compensating Jet. However, they are different! They are NOT interchangeable. The Brass Seat is also longer than a Compensator Jet. It is recommended to use a gasket under the brass seat. The Gas Adjusting valve housing nut used to install it, are made in two sizes (7/16" & 13/32"). To deal with the odd size, see Gas Adjusting Valve Wrench. The Gas Adjusting Valve housing's outside threads are 1/8" 27NPT (Pipe). Use Caution not to cut threads deeper, as it is a pipe thread. Carefully inspect the tapered end of the needle for wear ring caused by tightening it too tight. Damaged ones should be replaced. The GAV housing can become frozen in the pipe threads of the lower casting. The soft brass nut of the GAV is easily damaged beyond use. So, to remove such a GAV housing, cut the housing off just above the nut using a hacksaw. Then, remove the lower frozen part using a spiral screw extractor (Easy Out). Sometimes, they are really stubborn and have to be entirely drilled out.